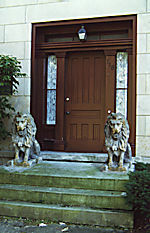 The large front door has side light windows on each side. 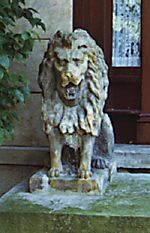 The two carved sandstone lions are from the top of the Bullinger Building, formerly on the riverbank downtown. They are named Rosie and Fred in honor of Rosie and Fred Bullinger. Copyright © 2019 Berea Historical Society. All Rights Reserved. Website design and development by Jillian Nichols.